The University of Rio Grande and Rio Grande Community College Symphonic Band will present its annual fall concert this Thursday, Nov. 15 at 7 p.m. in John W Berry Performing Arts Theater in Rio Grande. The concert is free and will have a patriotic theme to honor all branches of the service. 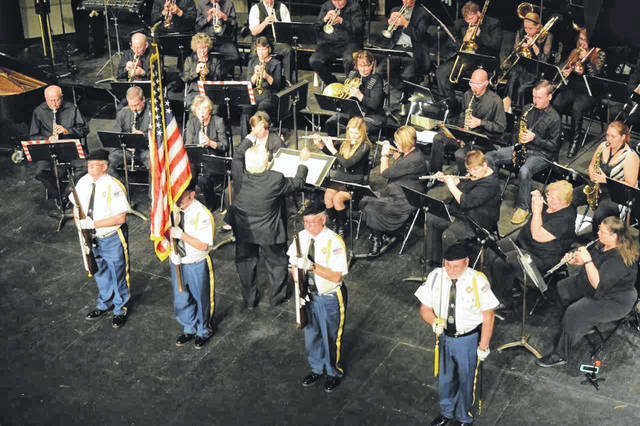 RIO GRANDE — The University of Rio Grande and Rio Grande Community College Symphonic Band will present its annual fall concert this Thursday, Nov. 15 at 7 p.m. in John W Berry Performing Arts Theater with a theme meant to salute area veterans. The concert will once again be under the direction of Gary Stewart, assistant professor of Music and Director of Instrumental Music. The concert will feature a celebration of Veterans Day with patriotic selections to honor all branches of the service, a presentation of the colors, a recognition of veterans in attendance, as well as a guest performance by the Grande Chorale. Stewart said the concert will include local VFW members presenting the colors as the show opens with the Star Spangled Banner. Other songs included in the show are, Americans We, A Salute to Mount Rushmore, Hymn to the Fallen, The Light Eternal and the Stars and Stripes Forever. The concert is free to the public. Anyone interested in more information about the concert can contact the School of Arts and Letters at 740-245-7364. Stewart, also a well-known local musician, was formerly a longtime band director for Point Pleasant High School who started the Black Knight Revue presentations and has also taught music in several local schools throughout the region.